I initially resisted alcohol markers, even though so many colorists raved about them. I didn’t like the way Sharpies smelled, and thought they were all like that. I found a small set of Bic Mark Its and they had much less strong odor, so I got their largest set. They blended well and I liked the results. No streaks like I got with water based markers, and different colors blended well into each other. The paper didn’t pill and the colors were nice and bright. 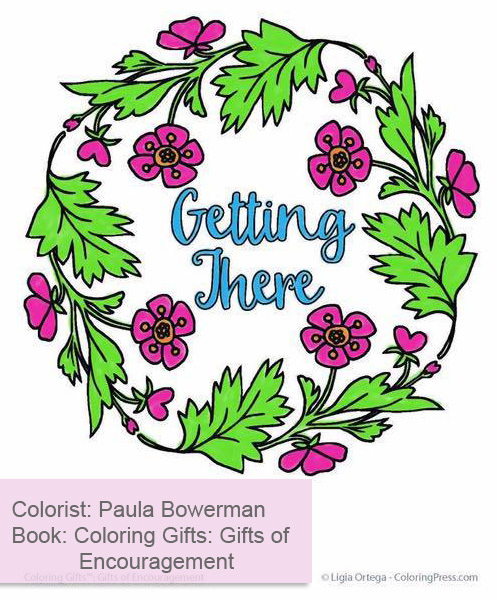 I colored this page (from my book Coloring Gifts: Gifts of Encouragement, also available as an electronic download) with Bic Mark Its: The largest Bic Mark Its set was only 36 colors, and I loved the way they blended, but I wanted more range to work with. After asking around and doing some research, I decided to try a small set of Spectrum Noir markers. Like Copics (which are very expensive) Spectrum Noir markers are dual tipped, refillable, and you can replace their nibs – but they are a more affordable price point than Copics. Like Copics, they have a large color range (more than 200), you can buy them individually, in small sets of six or sets of 24. The sets do not overlap, so you can build up your collection slowly over time without buying duplicates. So I tried a small set. And I really loved them! It had so many colors to choose from and they also blended beautifully. This page (from my book Simple Mandalas, also available as an electronic download) was colored with Spectrum Noir markers: I’m slowly building up my collection of Spectrum Noir markers. They have expanded what I can do with markers and there are a lot of colors to choose from. But I was left with a small budget set with limited colors, and a high end set with lots of color choices, but nothing in between for everyday coloring. So I tried one of the mid range alcohol marker sets, the Sketch Set of 80 Alcohol Markers by Arrtx. They have a good range of colors and they blend well. They have numbers and this is what the colors look like sorted by number: Of course, to be able to use them, I spent some time sorting them into colors and made a new color chart. As you can see, they have a decent range of colors in the pinks, reds, blues, greens, and browns. The only thing they seemed to be a little short on are purples/violets. 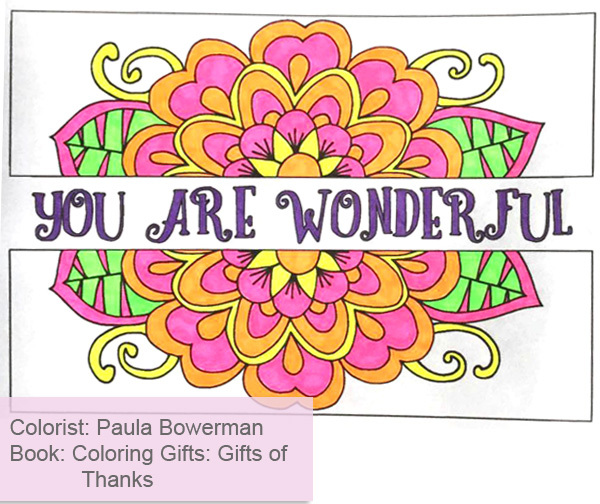 I used them to color the page below (from my book Coloring Gifts: Gifts of Encouragement, also available as an electronic download.) They were juicy (not one dry marker in the batch – I have heard that has been an issue with markers in this price range) they also blend well, and they come in a handy carrying case with labels on top so they are easy to store or take with you. They are also dual tipped – have a broad tip and a fine tip. They are not refillable. I recommend them as a good set of mid range markers for coloring. 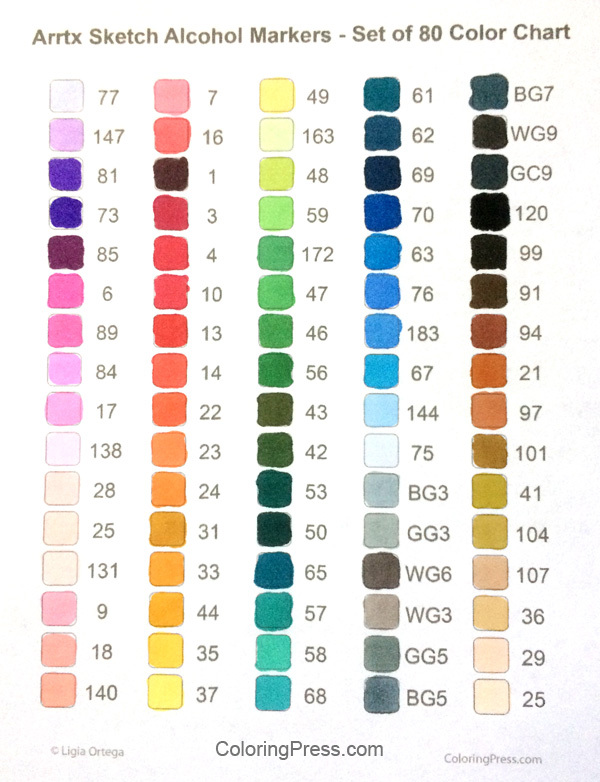 I also made the color chart above into an electronic download for anyone who’d like to use it. It’s available with my other electronic downloads. The paper you use makes a big difference for alcohol markers. Some paper, like office paper, is more likely to bleed outside the lines. 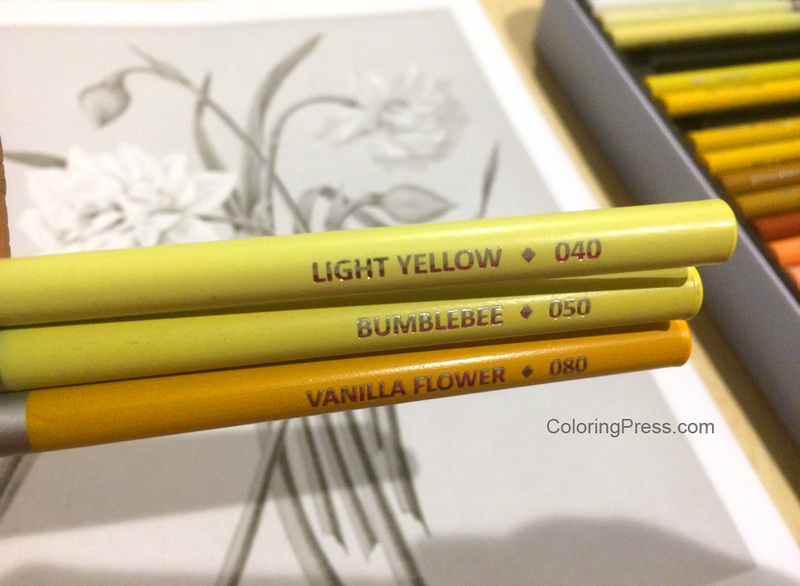 I color in the books with alcohol markers and they work fine, but whenever I print out or copy pages for coloring, if I’m using markers, I choose Georgia Pacific Premium Cardstock, in white, 110 lbs. If you look closely, this paper has two sides: one is smooth (ideal for markers) and one that is lightly more textured, I use that side for pencils, or for markers with accents or additional shading in pencil (always add after the marker is completely dry!) Remember to store your alcohol markers on their sides so they will last longer, especially these dual tip ones, otherwise one end will have too much ink and the other will be dry. For the Arrtx makers, I just zip the case closed and set it on its side when I am finished using them. And of course, alcohol markers bleed through paper, even cardstock, so always have an extra 2-3 sheets of paper behind whatever you are working on to avoid any permanent marker stains. One of the questions I hear most often is how to color grayscale, so I took photos and notes of my latest colored page as I worked on it to try show you what I did. I colored directly in the grayscale coloring book. I slipped a couple of pages behind the page I was working on to keep from having indentations in the page beneath, so that I could color it without issues later. I would recommend pencils or markers for coloring grayscale, but not gel pens (I’d say gel pens if you’re really good at shading with gel pens.. there is a person who is coloring this book with glitter pens and doing a gorgeous job) but to start out I’d suggest you try pencils or markers that are somewhat transparent so the darks can show through. I prefer to color grayscale with pencils, but some colorists add base layers in markers and then add more color with pencils. There is no one way to do this, use whatever media you are most comfortable with, this post illustrates what I did for this page. Some people are intimidated by coloring grayscale . Grayscale coloring pages are pictures with the shading already figured out for you. Try not to overthink coloring grayscale. You can try coloring it with just flat colors and be done (letting the darks show through), or add more pressure in the dark areas if you want more pronounced shading. Some think it’s supposed to be hard, be but it’s actually easier than coloring line art because the thinking about shading has already been done for you. 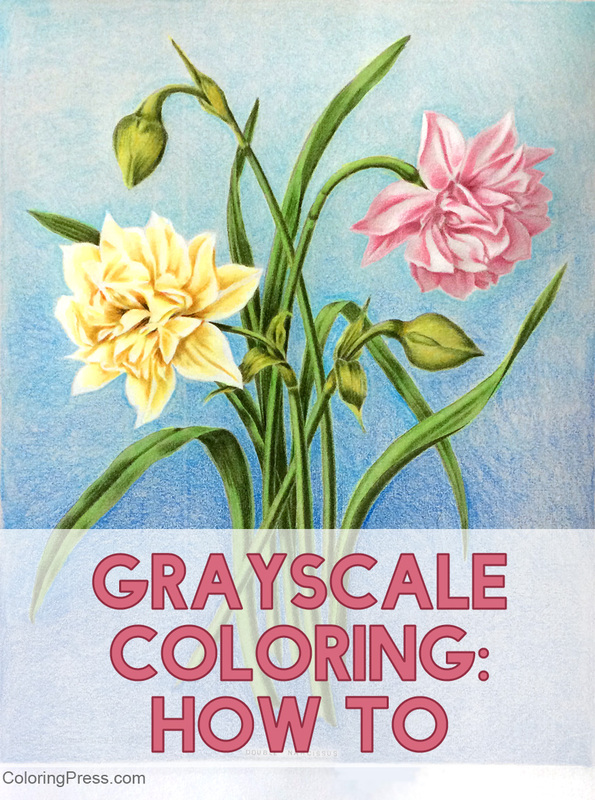 There are several ways to color grayscale. What I do is I pick an area and a color (light, medium, dark), color the darker areas first, then add a layer of medium color (either the same color with less pressure, or a lighter shade) over the medium gray areas, then add a very light or no color over the light areas. I work lightly and don’t press too hard so I can keep layering and build up color slowly. 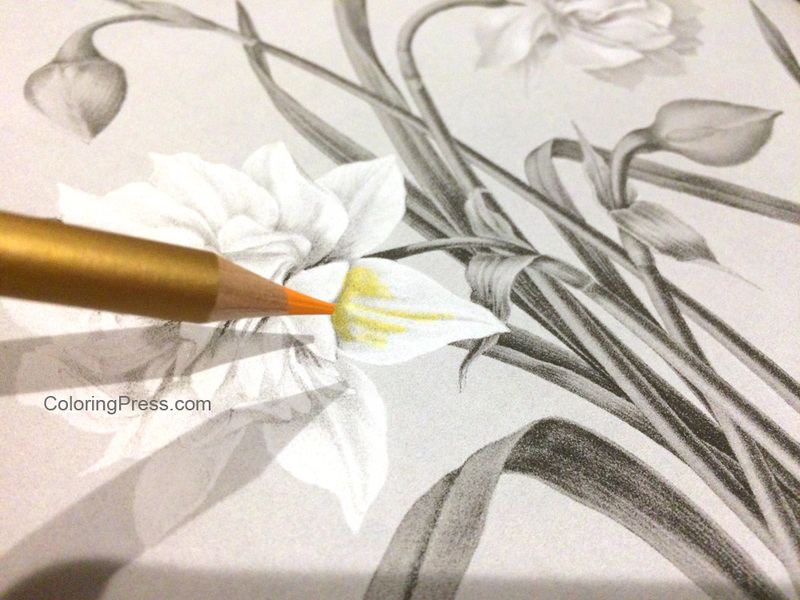 I start by adding a layer of Vanilla Flower to the darker areas of the flower I am coloring. Then I used the Bumblebee pencil and added a light layer over the dark, and also extended beyond the darks and colored some of the medium shades of gray. 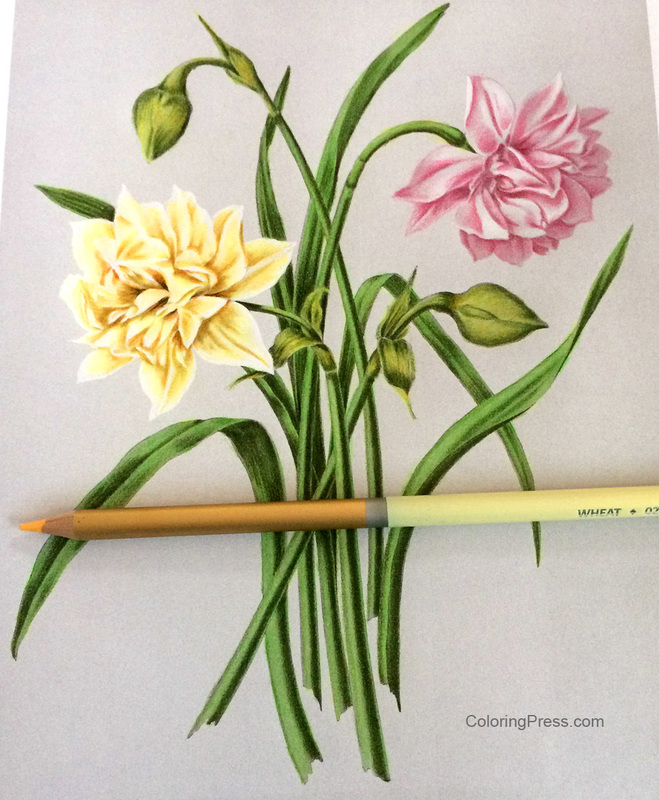 Next I’ll go over the darks and mediums with the light color (Light Yellow) and extend beyond the colored areas to add more color to the flowers. I left a little white in the lightest areas. 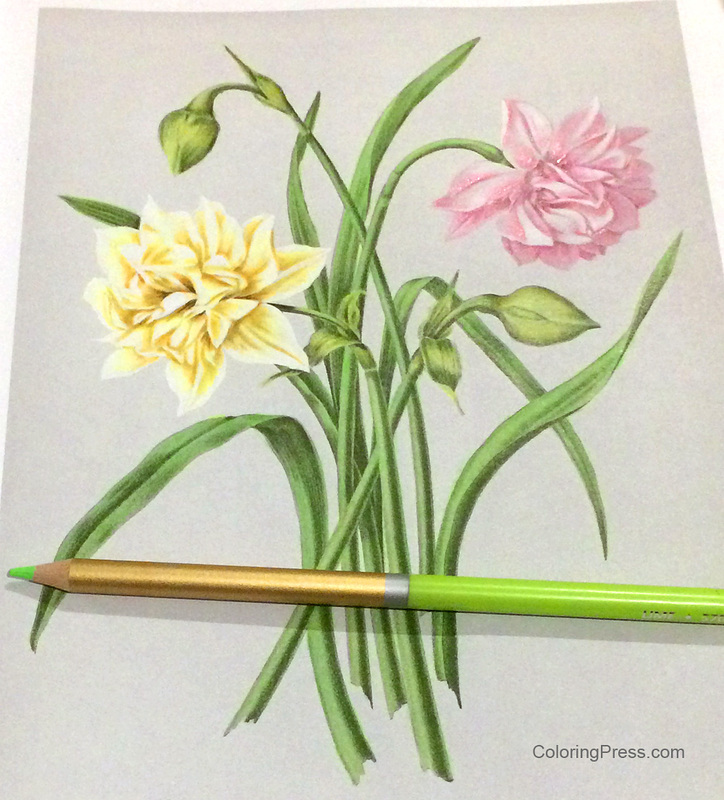 Because the three shades I used were very similar, the flower looks a little flat. To add depth and interest, I pick a couple of colors that are nearby in the color wheel. I picked a brighter color, this orange pencil (180) because it’s a dark color, I went over the darker areas. They really pop after having it added. The orange is bright, so I tone it down a little with a more neutral shade to continue to add depth. 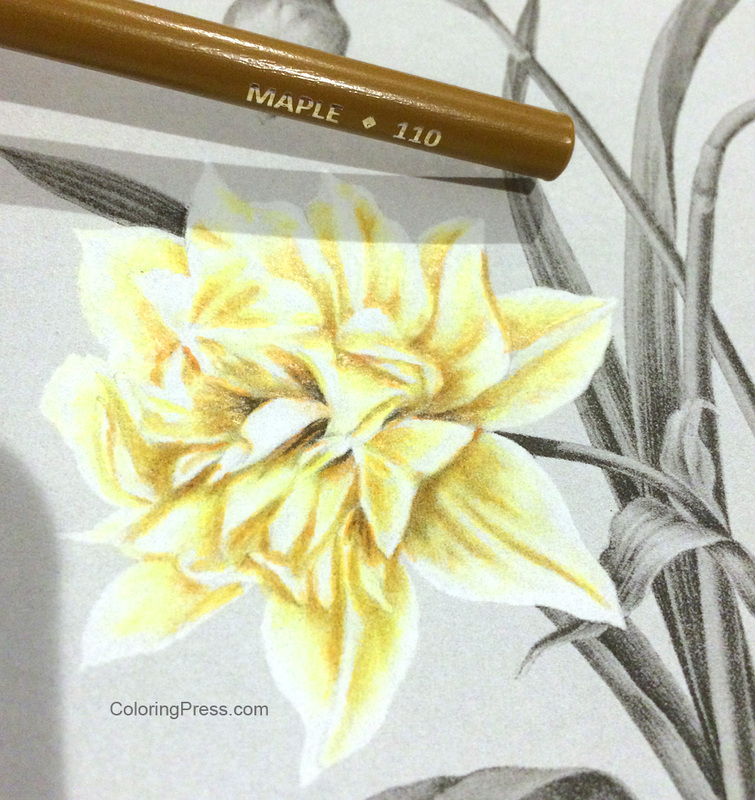 I used this Maple (110) pencil to help blend the orange into the flower and add a golden hue. I sometimes err on the side of going too light with the pencils I start with because it’s always easier to add more dark colors to a coloring page than it is to remove them. 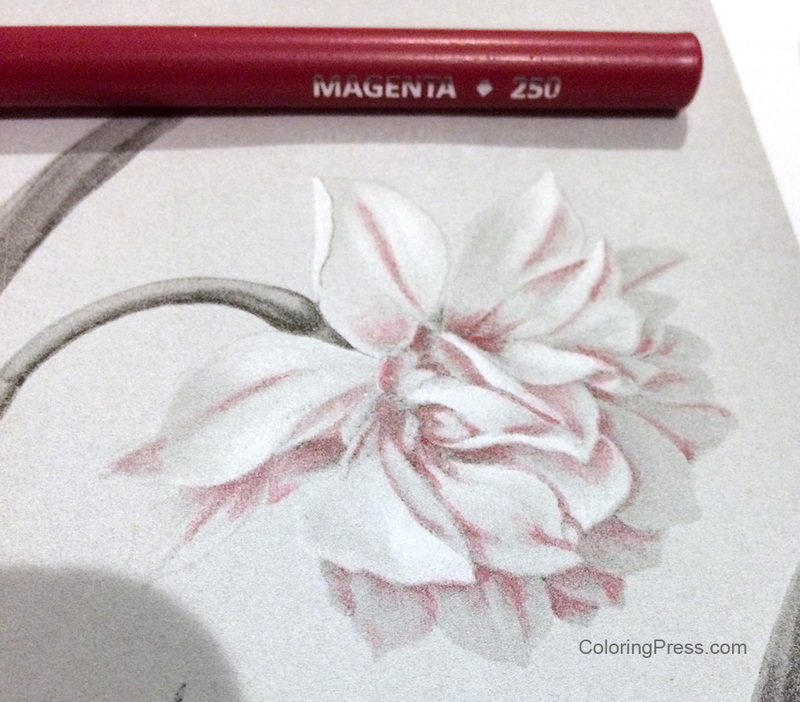 I start by using the Magenta pencil and coloring in the darker areas of the flower, working gently with a light layer. Then I added the second color (Carnation), again going over the darker area first, and beyond it to cover the medium gray. Next I added a soft layer of the next color, Pink Lemonade over the darks and mediums and beyond. I worked to add a very light layer and colored with less and less pressure to fade the color to white in the lightest areas of the flower. For my next part of this page, I started work on the stems and buds. for these type of flowers, the flower stems are a different, warmer color than the leaves. 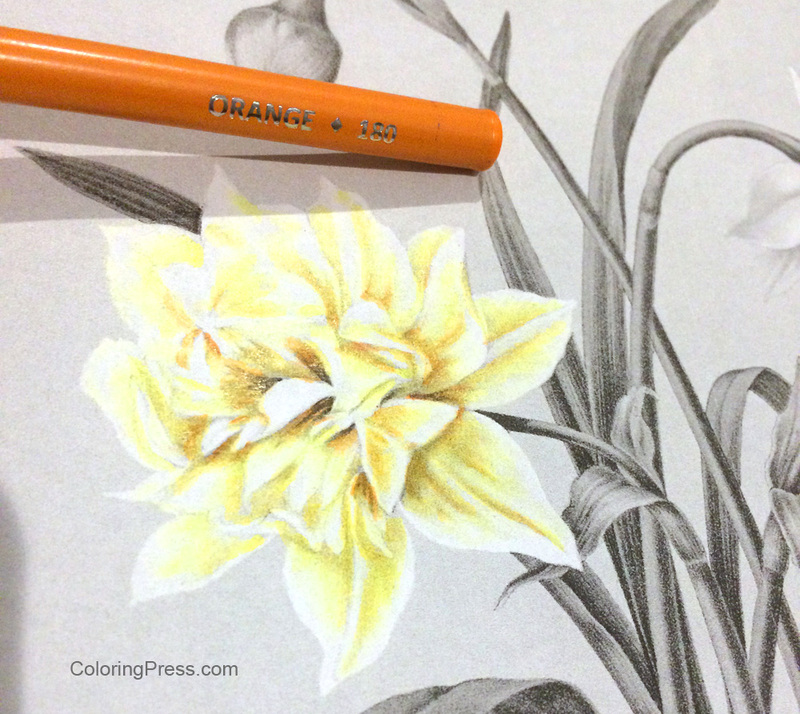 so I add a warm color as a base color, I picked this Yellow (60) pencil and went over the darker areas. This layer will help add warmth to the subsequent layers. Then I started adding some greens, I chose this warmer, Olive Green (580). I did soft layers and added a little more and a little more each time, another warm green, cypress tree (590). To liven up the colors, I picked a pretty Lime Green (570) and added it as my light color over all of the stems, adding less pressure to the lightest areas of the image. I moved on to the rest of the stems and leaves next. I picked this Olive Green (580) as my dark and added a soft layer to all the darker areas of the leaves and stems. 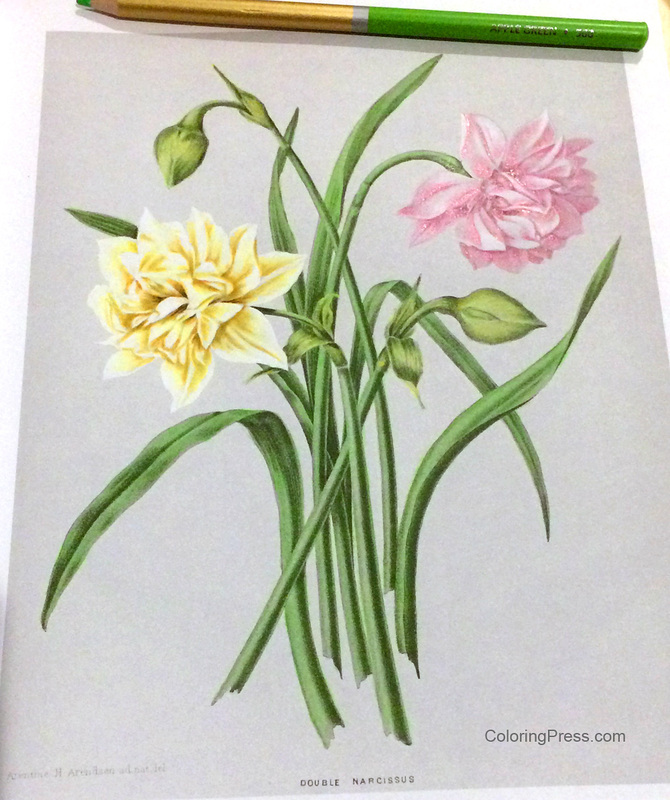 Here is a closer view of the picture above showing how I colored the darks on the stems and leaves. The leaves were looking good, but the color looked flat. So I added a layer of Lime (570) green to all the leaves and stems to add depth and more interest. It perked up the leaves considerably! Next I added a little more contrast to the darks and depths to the color of the leaves and stems by adding some Cypress Tree (590) to the darks, adding more pressure to the darkest areas, and a little less to the other darks. 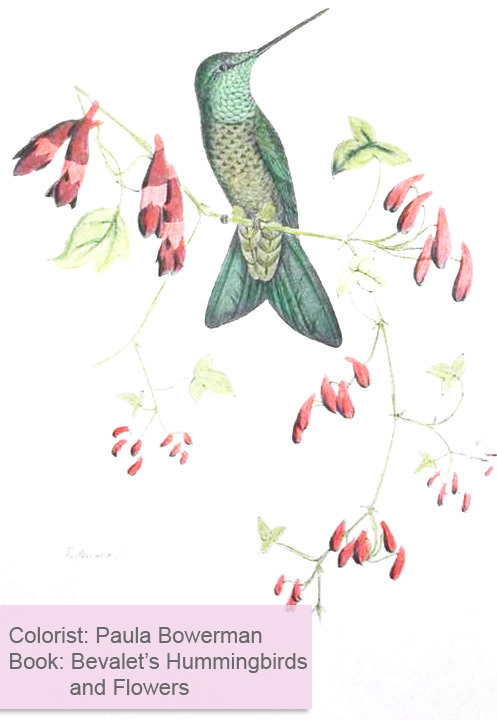 The main page is colored. 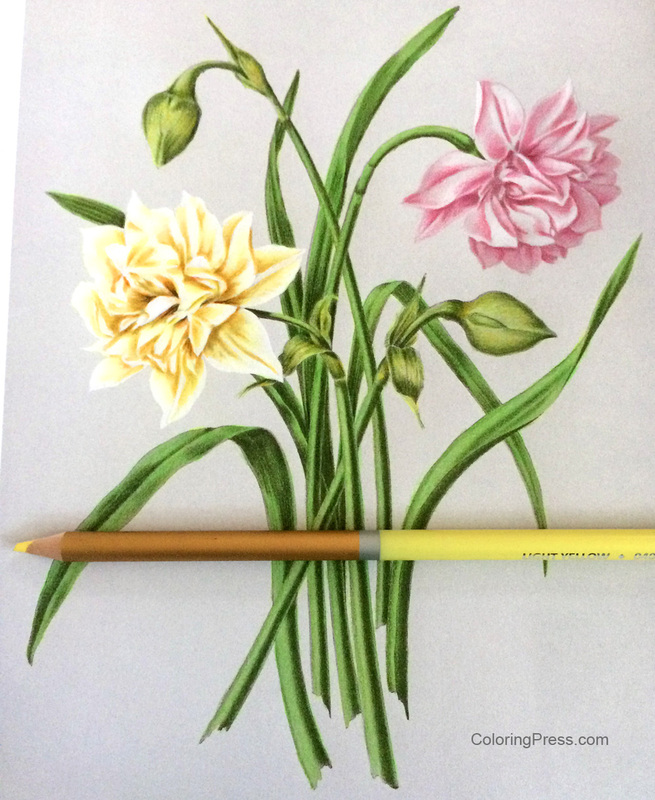 I went back and added a little color to the yellow flower, and added this color also to the warm parts of the stems and buds to add emphasis to the warmth of those parts of the picture. 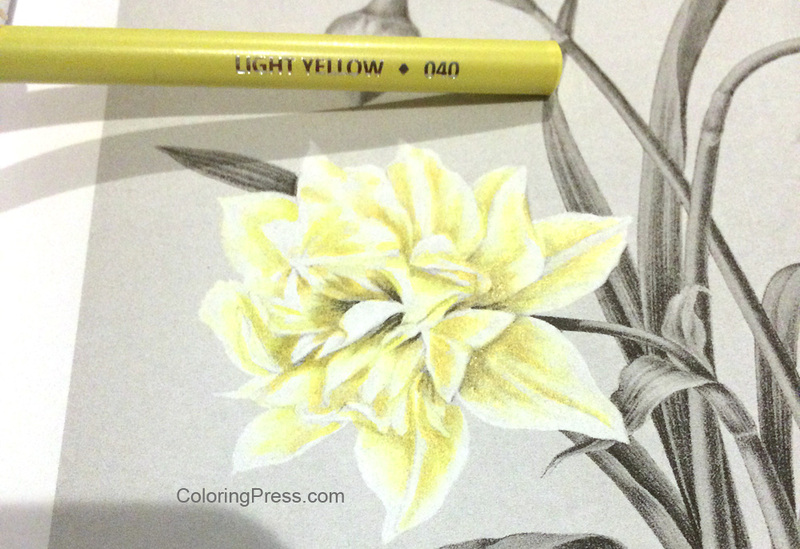 I used some Light Yellow (40) to go over the yellow flower again and add more depth to the colors. 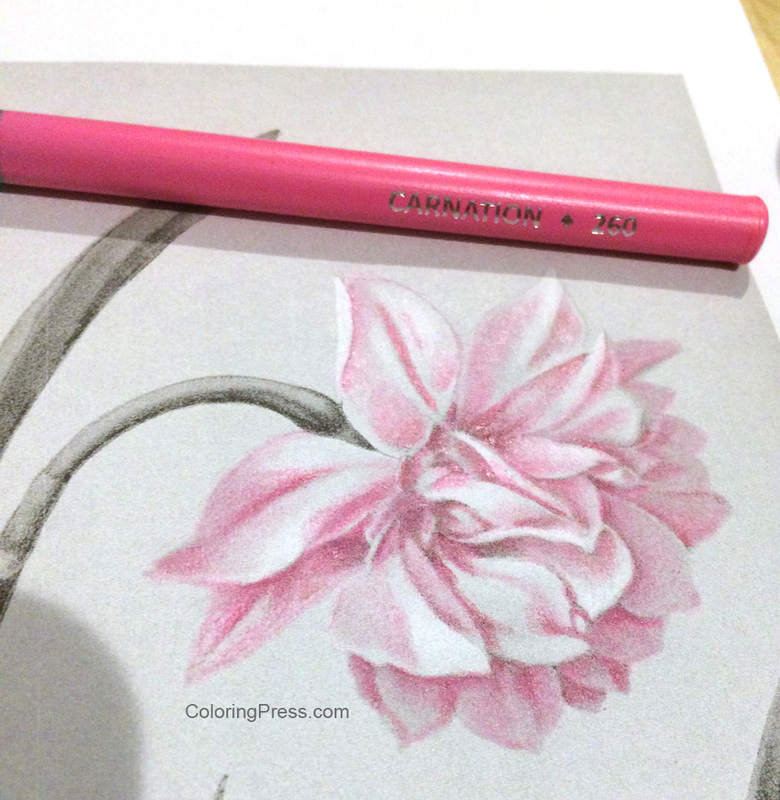 I added more pressure to the darker areas, trying to define the shape of the flower petals. 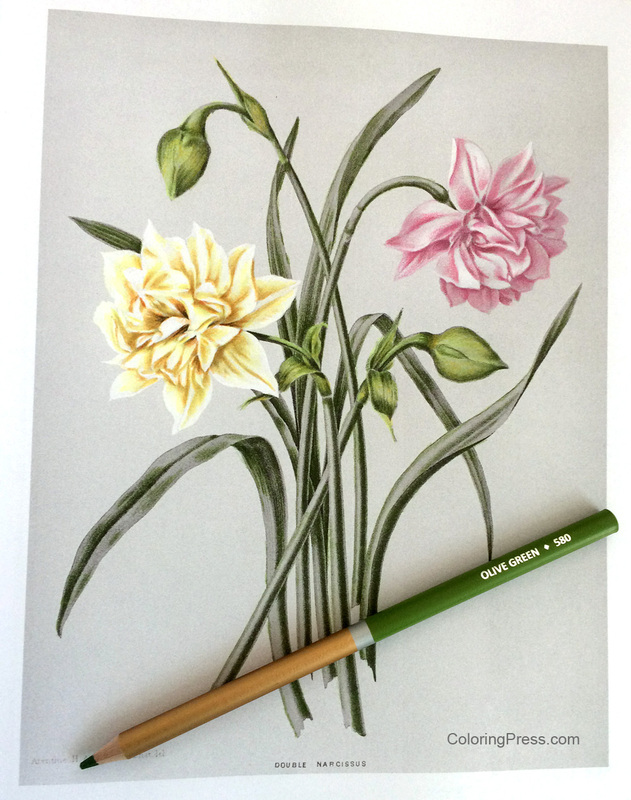 Then I went over the flower again to add a little more definition to the lighter areas of the petals and make sure they were distinct. 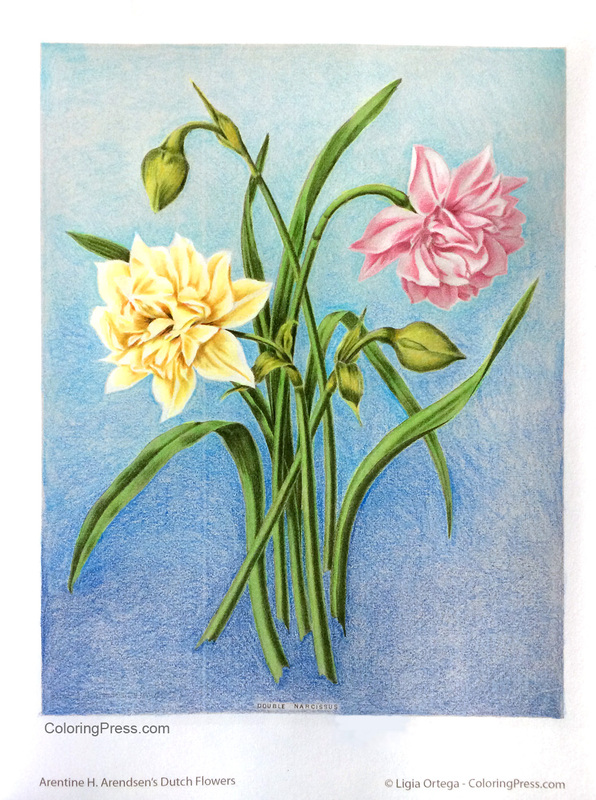 I used a light, warm color, Wheat (020) for this, and also added a layer to the warm areas of the stems and buds. These light layers add a nice depth to the colors add realism, and keep them from looking flat/canned. I then colored the background. Although this was a flat background, I used a gradation of four different colors from top to bottom to add interest: Blue Lagoon (470) on top fourth of the background, adding less pressure at the bottom of the layer, then slowly blended the second quarter of the background into a swath of Cerulean (460) across the background, next I used Summer Sky (450), and segued into Cobalt Blue (440) at the bottom. To add more interest I added a little bit of Deep Blue (420) to the very bottom. The background is a large flat area and shows more texture. One thing that could be done to soften the texture is to add some alcohol to blend the colors. 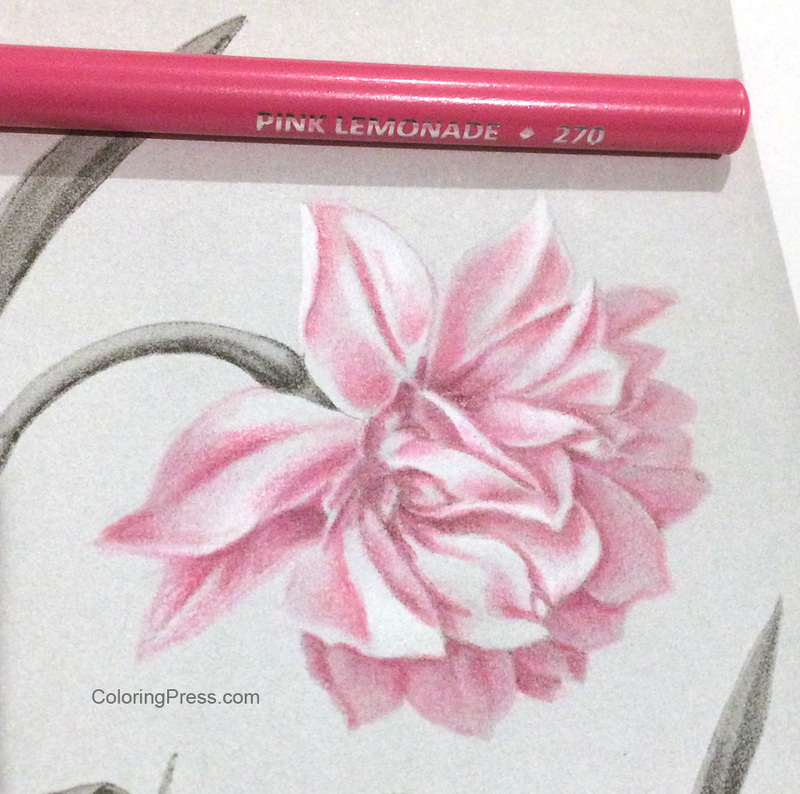 You can find more information on how to blend colored pencils in my post about colored pencil blending. So there you have it, a breakdown of what I did to color this page. This was my first time using Schpirerr Farben pencils and they worked well for grayscale, I was able to make multiple light layers and they did not feel gummy or sticky. They work well for blending and layering. I will test them on line art next to see how they perform. 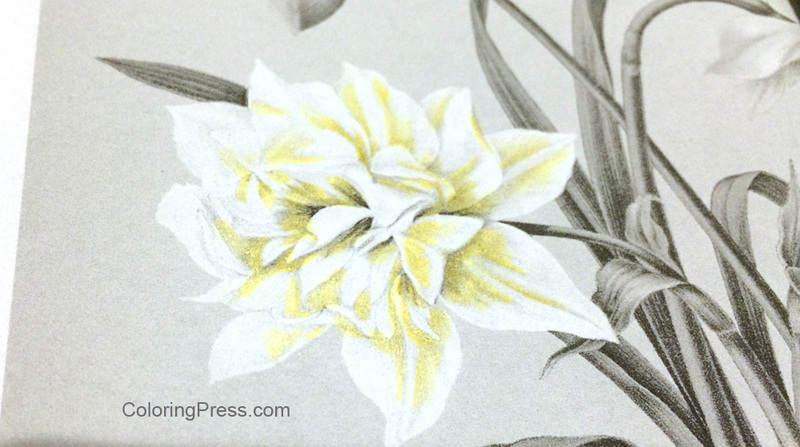 This grayscale book is not as detailed as others I have published, like Arthur Rackham’s Fairies and Nymphs. That book has images with small details, and I had to make sure my pencils were sharp when coloring pages from that book. You can try this page with different media, but what I’d recommend is that you pick something that is fairly transparent so the shadows show underneath. The beauty of this type of coloring is that the lights and darks are already figured out for you. Give it a try and let me know how it works for you! One of the most enjoyable parts of being a coloring book author is seeing colorists put so much talent into coloring the pages I publish. It truly adds meaning to the work I do and I wanted to share some of this wonderful work I see, so I will be featuring colorists on this blog on a regular basis in my Colorist Showcase series. Today’s featured colorist is Paula Bowerman. She is a prolific colorist who is talented in choosing bright, cheerful palettes to really make her colored pages stand out in the crowd. Her colored pages are so bright and cheery. I was happy when she agreed to share about her coloring with us. How did you get into coloring? I have always coloured before it became acceptable for adults to colour . I would just colour from children’s books ! I just got more into it when Art Therapy magazine came out and yes I’m still collecting it ! We are at issue 1110 now ! What are your main reasons for coloring? 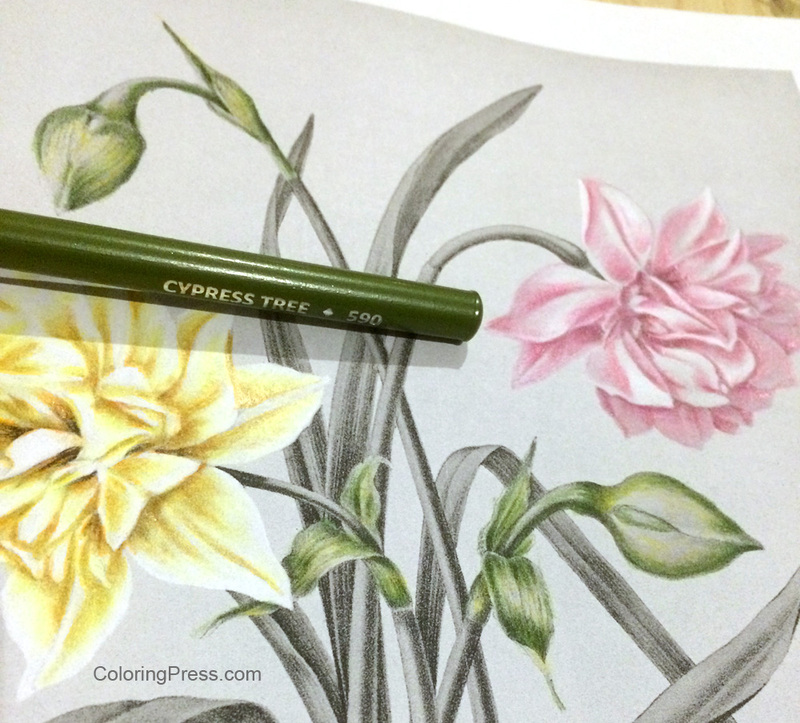 Main reasons for colouring are enjoyment ! I just love colouring ! What are some of your favorite genres/types of coloring books/pages to color? My favourite genres to colour are animals! I like fantasy and mythical too! Do you have any favorite supplies/tools? I really like using my Stabilo 68 pens and other markers . I have lots of different pencils but prefer pens so much easier to colour with in my opinion! Are there any coloring techniques that you have recently learned or that you’re particularly excited about? I tend to stick to 3 colours in most of my pictures , I find it very difficult to put loads of different colours on my pages ! 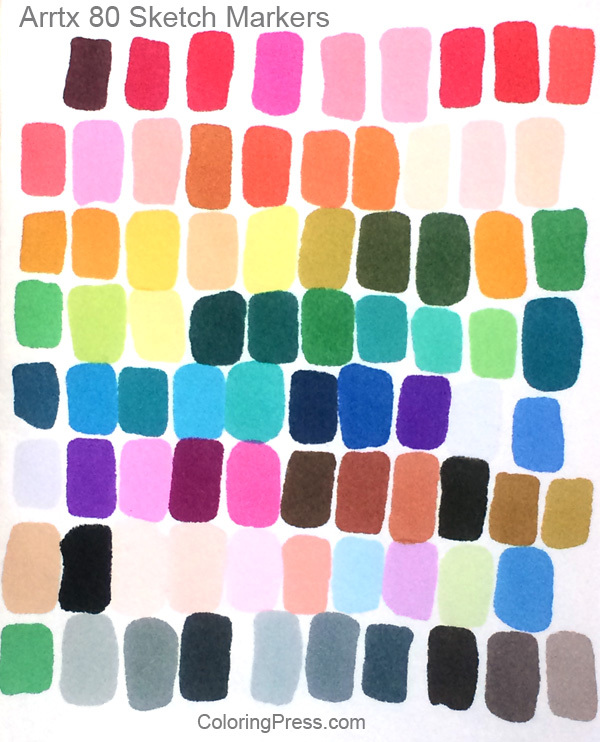 Do you have any particular colors/palettes you like to use when you color? Blue tends to be a colour I use a lot of and red ! Are there any supplies or techniques you would like to try someday? I would love to try copic markers one day but I’ll need to win the lottery for that lol. 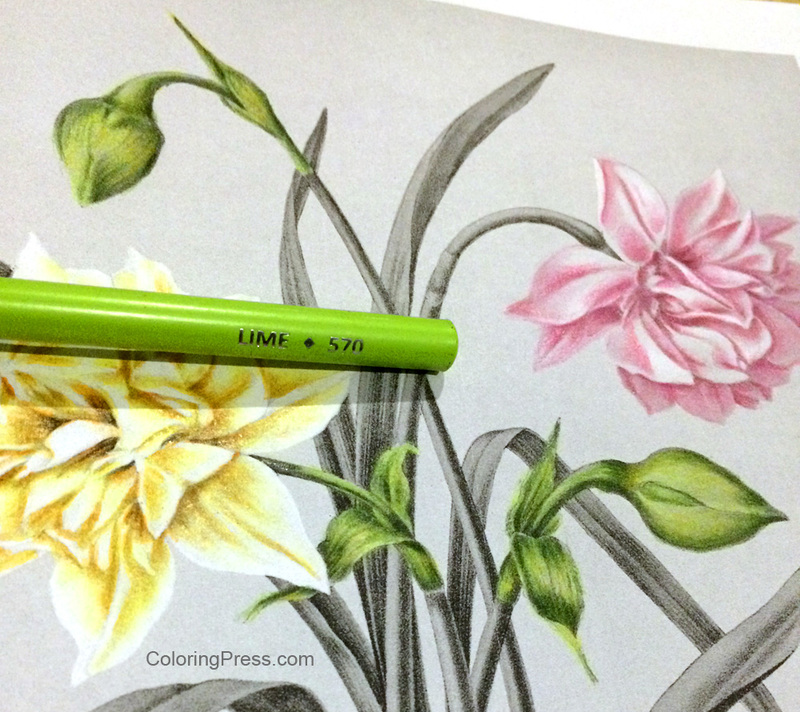 Do you prefer to color in coloring books or print out your pages? If so, do you have any particular paper you prefer? Much prefer colouring in my books than on loose sheets. I never take any pages out of my books either ! 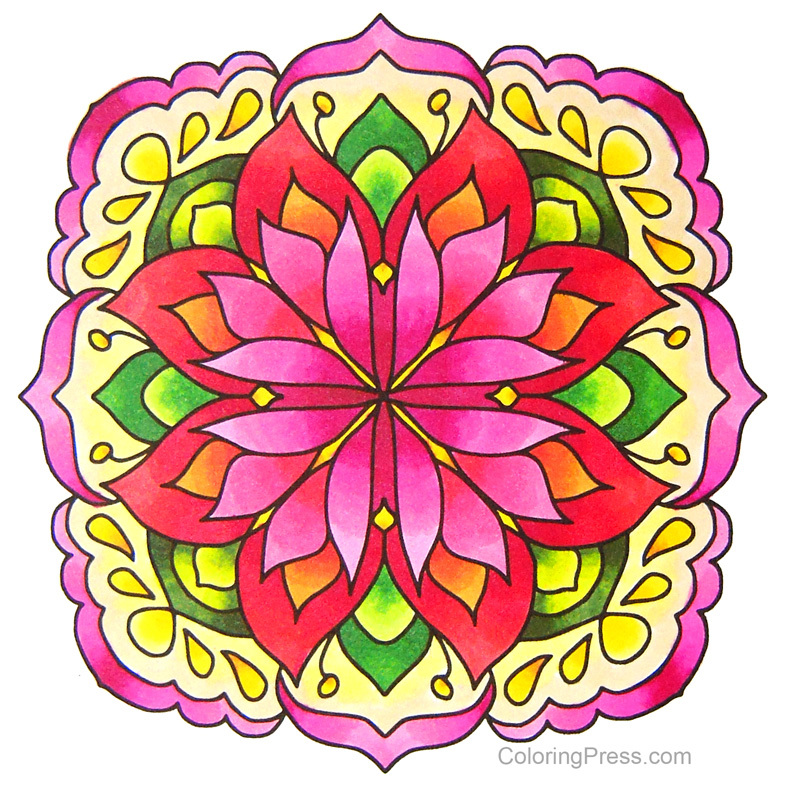 Do you have any tips or advice to anyone who just discovered Adult Coloring? To people just discovering colouring don’t stress over it , just get a pen and start colouring , it’s supposed to be fun and relaxing ! Enjoy ! Join some Facebook colouring groups , you’ll meet some lovely people on there who give out good advice ! 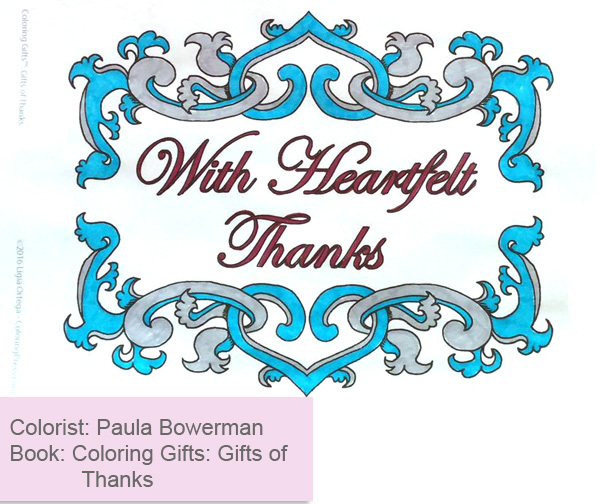 Thank you so much again Paula, I appreciate learning more about you and your coloring. Stay tuned for more featured colorists in future blog entries! One of the most enjoyable parts of being a coloring book author is seeing colorists put so much talent into coloring the pages I publish. It truly adds meaning to the work I do and I wanted to share some of this wonderful work I see, so I will be featuring colorists on this blog on a regular basis in my Colorist Showcase series. Today’s featured colorist is Amanda Pinchbeck. She is a prolific colorist who is talented in choosing beautiful palettes and choosing the right combination of color and shade to really make patterns pop. Her colored pages add a bright spot to my day. I was very happy when she agreed to share about her coloring journey with us. How did you get into adult coloring books? I saw an advert on TV for ‘Art Therapy Magazine’ in March 2015, subscribed to the magazine and, once it arrived, started colouring their pictures using their pencils. A month later I was invited to join a colouring group on Facebook and discovered the wonderful world of adult colouring books! I retired from work due to chronic health problems/physical disability in 2010 so, because I wasn’t always able to get out of the house, I wanted to find something other than reading fiction and doing crosswords (which I still do) to fill my time. I have never seen myself as being artistic but have a decent eye for colour so this is a great way to use my creativity. It also helps me focus on something other than my chronic back pain and keeps me in touch with the ‘outside world’ on Facebook. 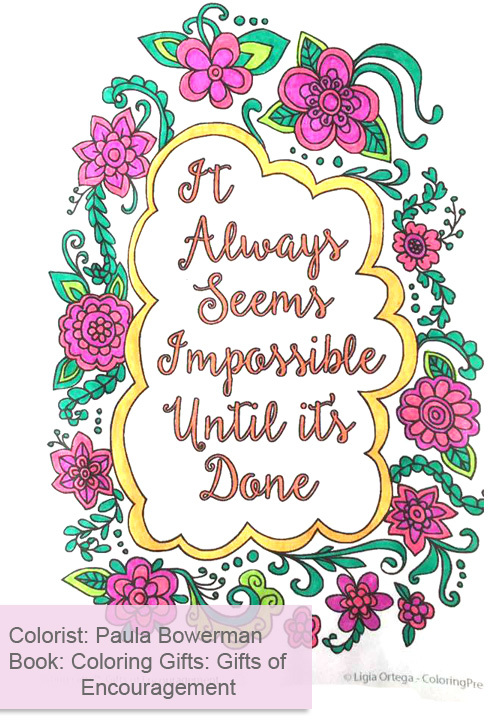 I’ve always enjoyed Johanna Basford and Millie Marotta’s books as they were the trailblazers in the adult colouring world. However, since I purchased the ‘Adult Coloring Treasury’ and its sequel I have discovered many other artists who I enjoy and those books have become more like shopping lists! For example, as well as the wonderful Ligia Ortega, I also love Christine Aldridge’s beautiful floral designs. I now own all of her books and belong to her colouring group on Facebook. 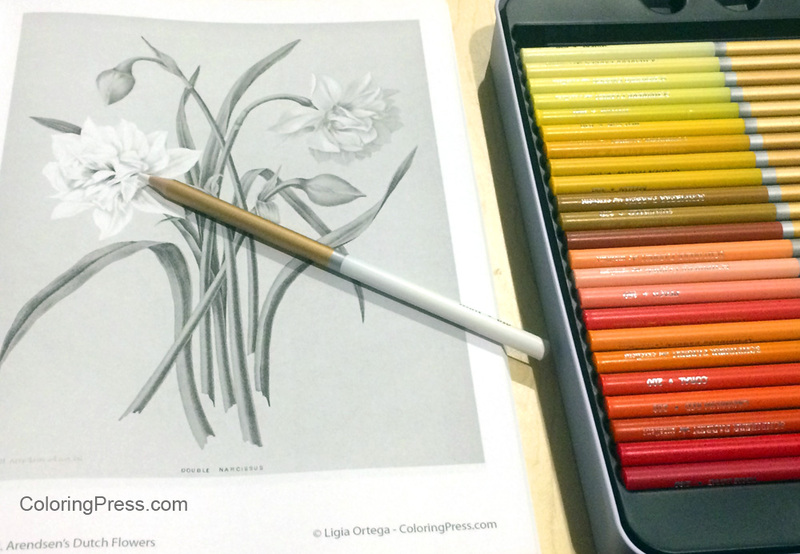 I really love my full set of Prismacolor Premier colouring pencils which were a Christmas present last year. 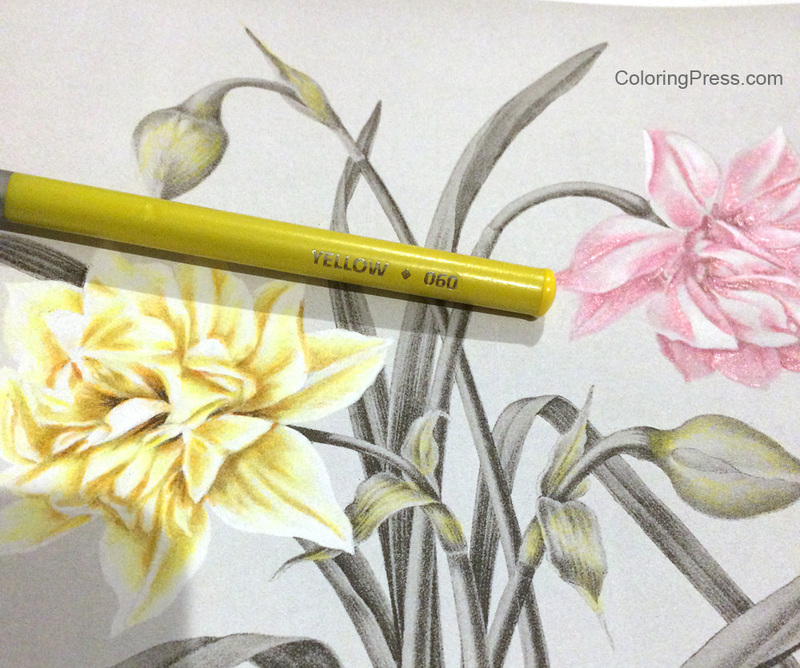 However, I still go back to my Marco Raffine colouring pencils when I want to use a particular colour for a design. I also occasionally use pens and my favourites there are Staedtler Fineliners (particularly useful for lettering on Ligia’s designs). Although I have recently purchased Helen Elliston’s ‘Colorist’s Special Effects’ I haven’t yet got around to trying out too many of the techniques although I intend to do so. 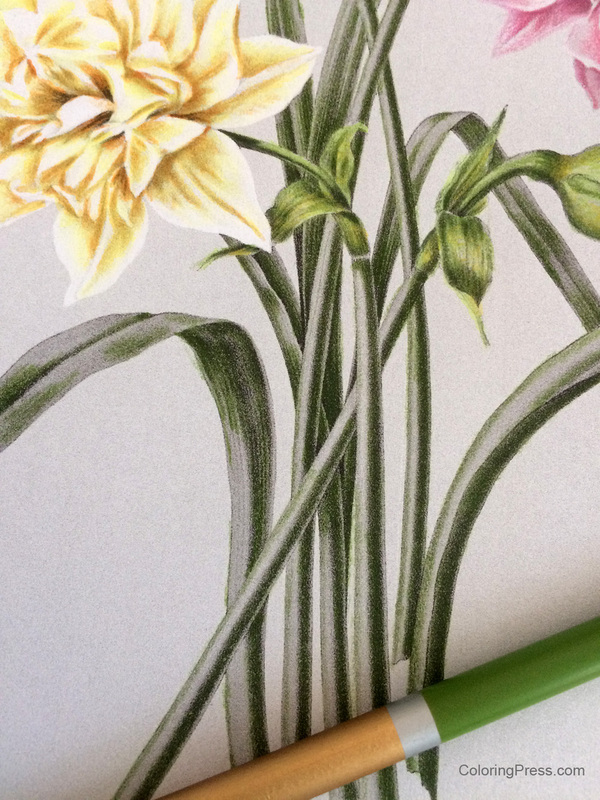 My favourite colour is green but each set of pencils that I’ve used as I’ve gone along has given me different colouring ideas. I still like a lot of pink and purple and orange is a favourite combination. 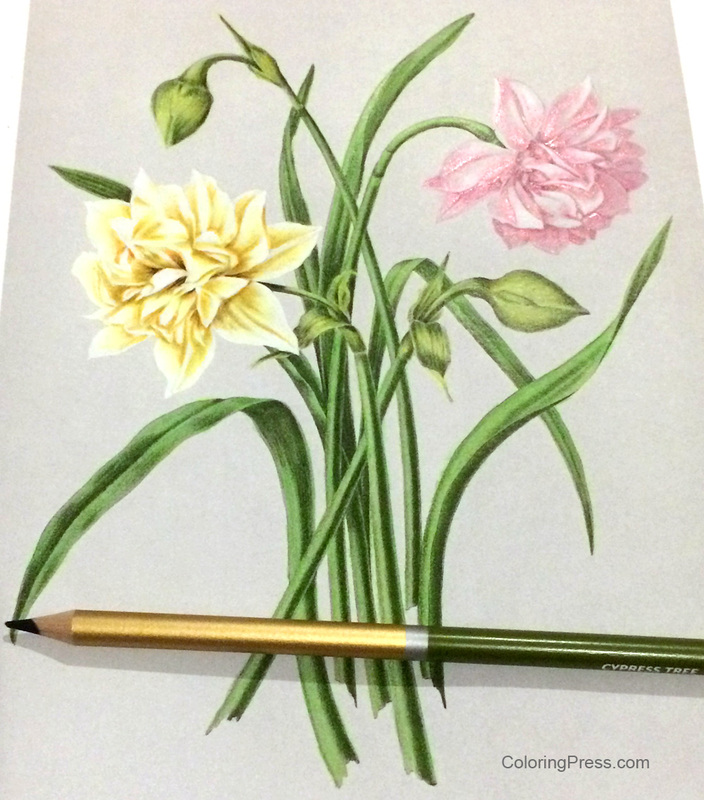 I’ve seen an advert on Facebook for Chameleon pens and pencils which look interesting but I’m happy with my Prismacolor Premier pencils at the moment. As far as techniques are concerned, I will be trying out ideas from Helen Elliston’s ‘Colorist’s Special Effects’ soon. Unfortunately my printer is rather unreliable (it thinks it should only need to be a scanner so at least it works to scan my pictures!) so I use colouring books and magazines such as ‘Art Therapy Magazine’ and ‘Relax with Art’. Enjoy it! Join a friendly Facebook group such as Colouring Companions or Adult Colouring Book Reviews. You’ll learn so much from seeing what other people can do but try not to worry that your work isn’t ‘good enough’! Everyone is their own worst critic and you may give someone else ideas for a new colour palette. Colourists are a very friendly bunch in my experience and colouring book artists are always eager to see pictures from their books as everyone’s style is slightly different. I’d certainly encourage people to get hold of the ‘Adult Coloring Book Treasury’ books available from Amazon to give them the opportunity to try different artists’ styles and share your work in their Facebook group. 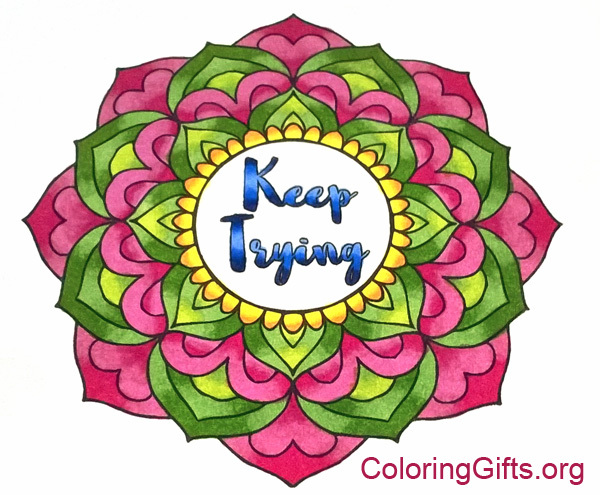 This is excellent advice for beginners, I have found the community in coloring groups to be very uplifting and have made many warm caring friends through the groups – they are so much more than just colored pages and techniques. 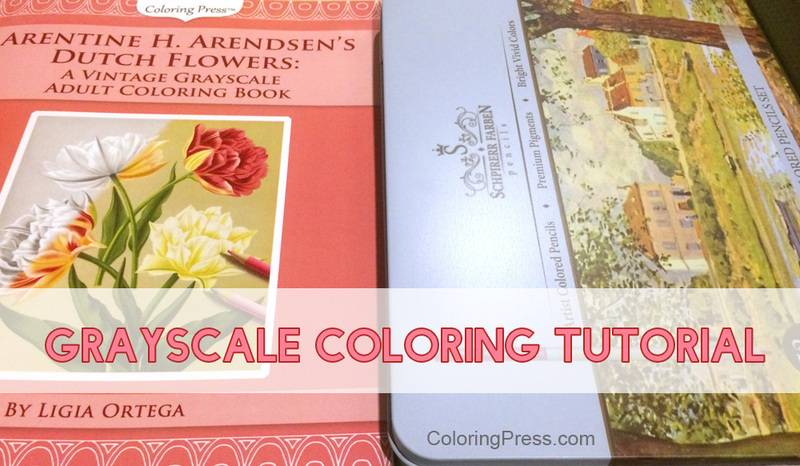 Thank you so much again Amanda, I have appreciated learning more about you and your coloring! Stay tuned for more featured colorists in future blog entries! One of the most enjoyable parts of being a coloring book author is seeing colorists put so much talent into coloring the pages I publish. It truly adds meaning to the work I do and I wanted to share some of this wonderful work I see, so I will be featuring colorists on this blog on a regular basis in my Colorist Showcase series. Today’s featured colorist is Shawn Hallenbeck. 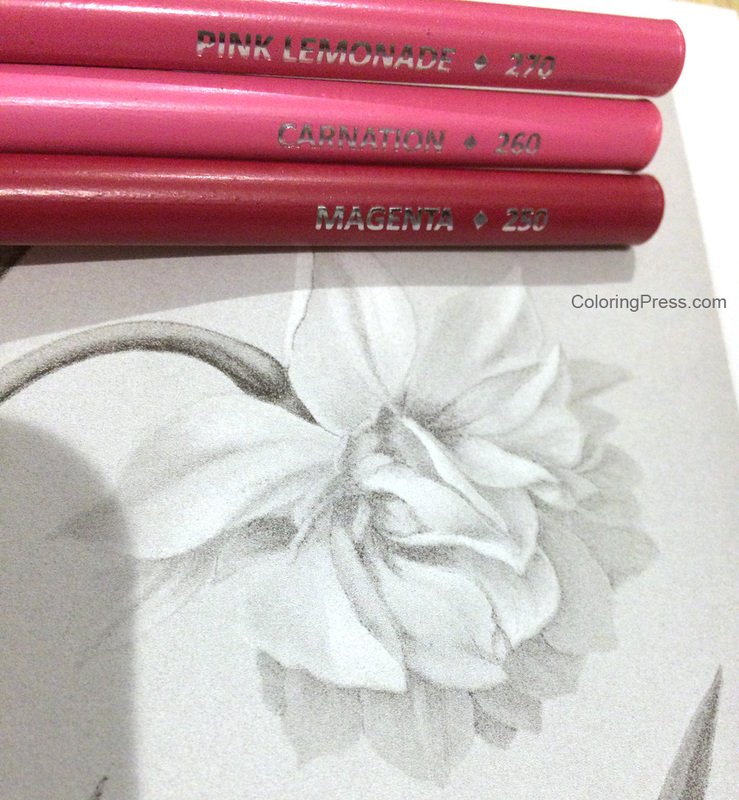 She is an amazing colorist who is equally talented with line art and grayscale coloring pages. She makes magic with Spectrum Noir markers – her shading and palette choices are simply amazing! Seeing her work always lifts my spirits. I was very happy when she agreed to share about her coloring journey with us. I’ve been coloring since I could hold a crayon. I really couldn’t find any good “adult” coloring books until the early 80’s. I really appreciated when the coloring craze hit, because now there’s a plethora of “adult” coloring books! As far as how I got into the Coloring Groups on Facebook, my goddaughter gave me an Adult Sweary Coloring book for Christmas 2016 that had a link to the artist’s Facebook group, and the rest is history! It’s a form of meditation for me. I like to color text and simpler designs (short attention span). All of them! I do love my Spectrum Noir sparkle pens. Are there any coloring techniques that you have recently learned or that you’re particularly excited about? None that are recent, but I’m always learning! Yes, I’m a sucker for hot pink, orange, and yellow together. Also, purple, aqua blue, and lime green! I’d like to try some Caran D’ache and/or Holbein pencils, and watercolor techniques. 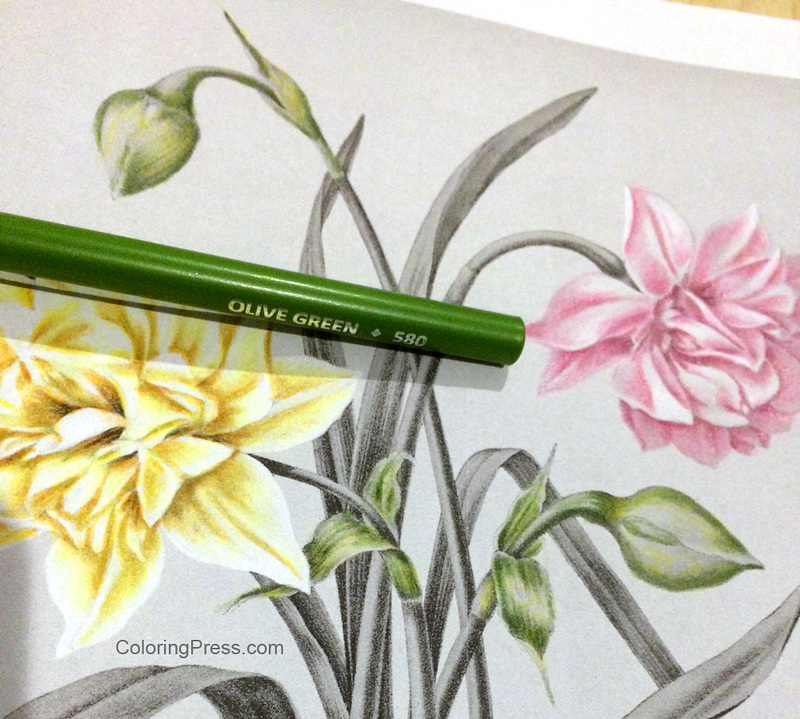 It depends on the quality of the paper in the book & the medium that I’m using to color that page. 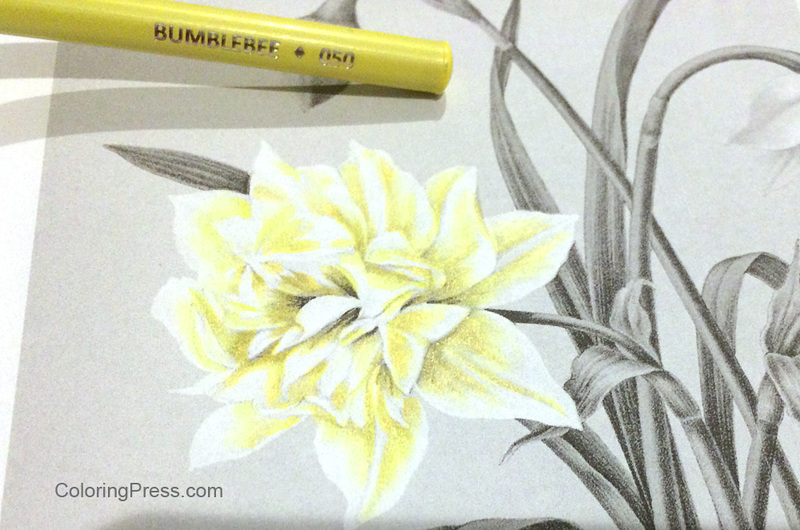 If I’m using colored pencils, standard coloring book paper usually works for me. I also, cut the pages out of the books, I find it difficult to color in the book. As far as preferred papers, I usually go for a 65lb cardstock. You do NOT need expensive supplies! Learn techniques first. If you don’t, it won’t matter how many supplies you buy/own! Do NOT compare your coloring to anyone else’s! 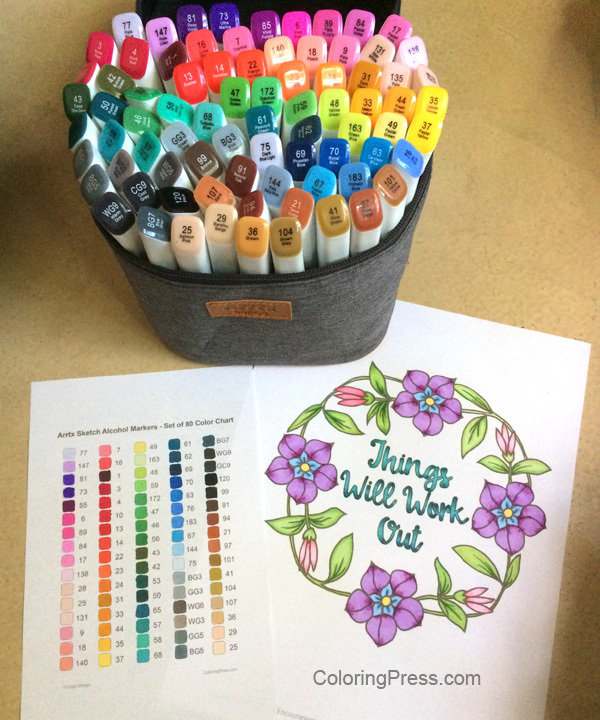 Don’t be afraid to share your work in the coloring groups. Don’t be afraid to screw up! Markers bleed through the paper, it’s what they are supposed to do! That is wonderful advice! Thank you so much Shawn for taking the time to share some of your experience with coloring and your gorgeous colored pages. Stay tuned for more Featured colorists in the near future!